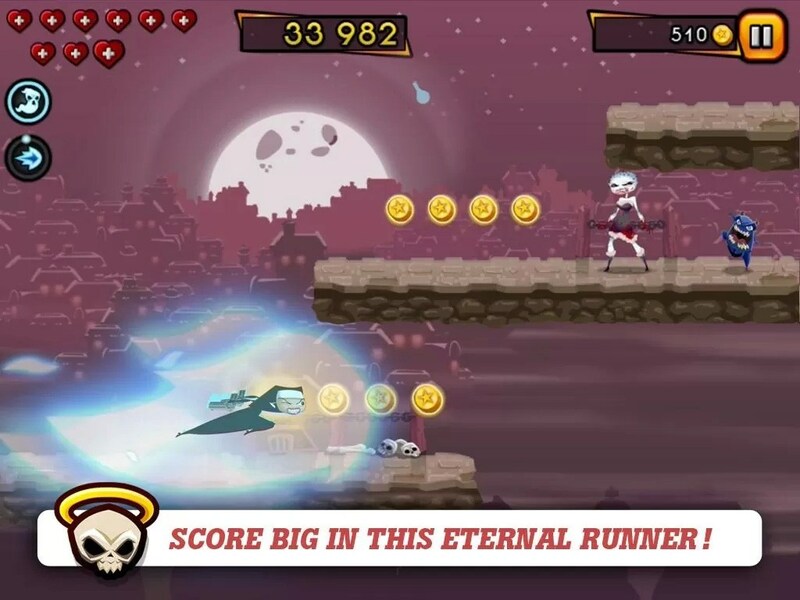 Nun Attack: Run & Gun – Games for Android 2018 – Free download. 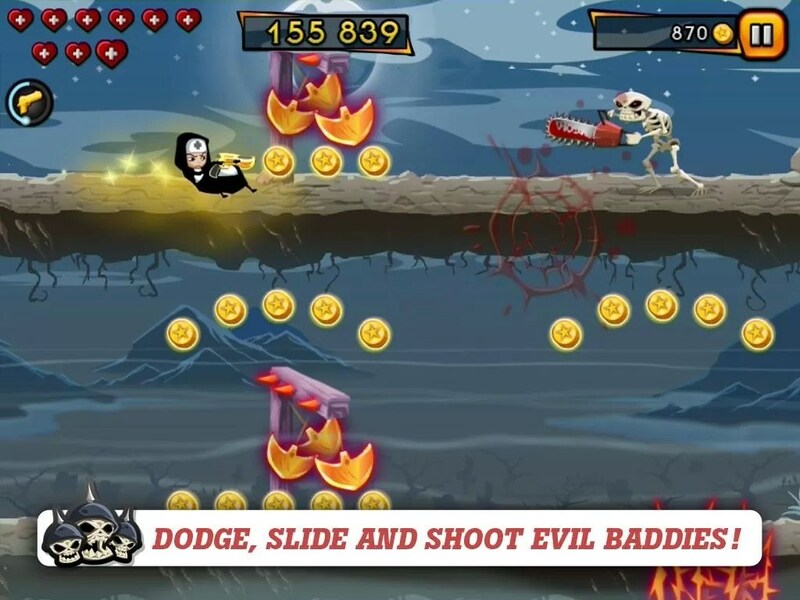 Nun Attack: Run & Gun – Dynamic arcade game about fighting nuns. 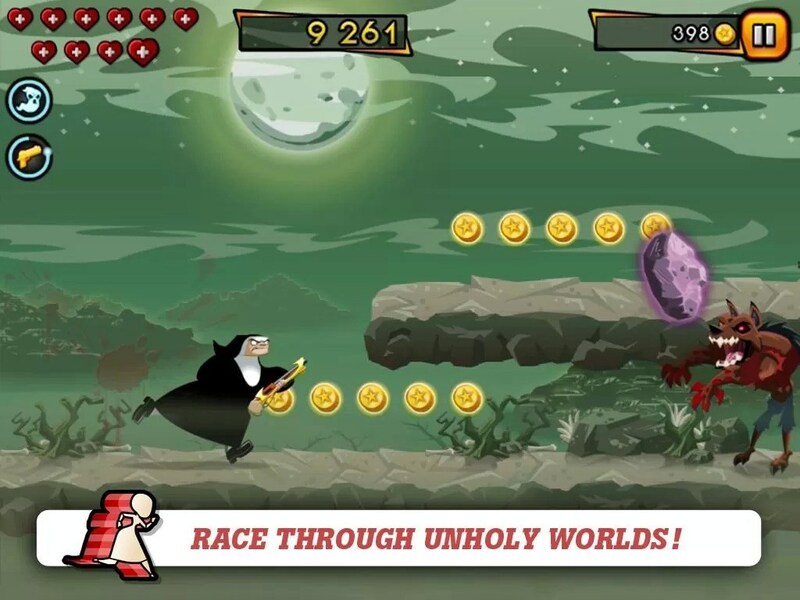 Nun Attack: Run & Gun - a dynamic game for Android in the genre of "Runner" with fighting nuns and small arms. We will run through the circles of Hell, jump over obstacles and shoot different evil of the holy weapons. Development of the game deals with Frima Studio Inc, the authors are very popular game Nun Attack , which continued this game is. If the first part of the game was a tactical RPG, then here we have a classic "Runner" with endless levels. The graphics are very good, though, and 2D, but with high-quality elements and portrayal of character animation. In terms of gameplay there's nothing unique, but the dynamics of the game happy. We will run, shoot dead and jump various obstacles. Approximately every minute we get into a portal that transports us to another world. Depending on the world where we get, our enemies will be - skeletons, werewolves or vampires. 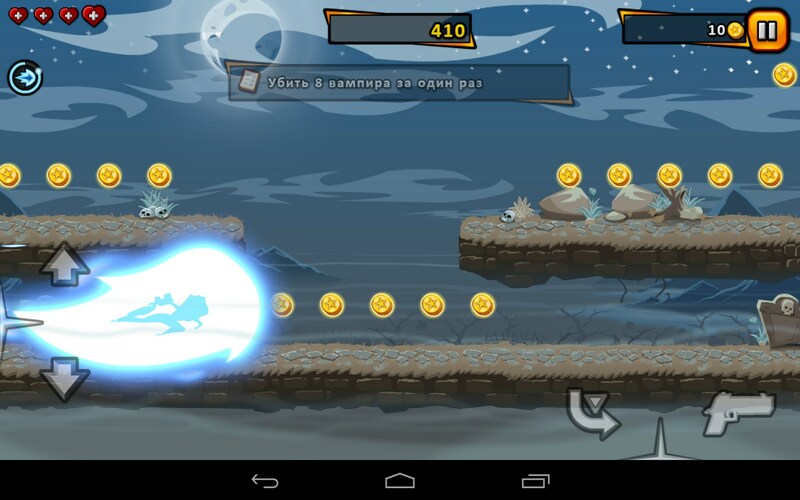 Character automatically run, and we in turn controls jumping, sliding and shooting. From left are buttons to move one level up and level down the up button is also responsible for the jump to the right is a button for shooting and sliding. All in game four of the heroine, each with unique weapons and increased force against a particular type of enemy. Initially it will be available to only one nun, and the rest have been open for coins earned in the game. Also, these coins can buy better weapons and a variety of super powers. At each level, we are given a few lives, depending on the level of the nuns. Life saving only when faced with monsters, if you run into an obstacle, the game will be over. 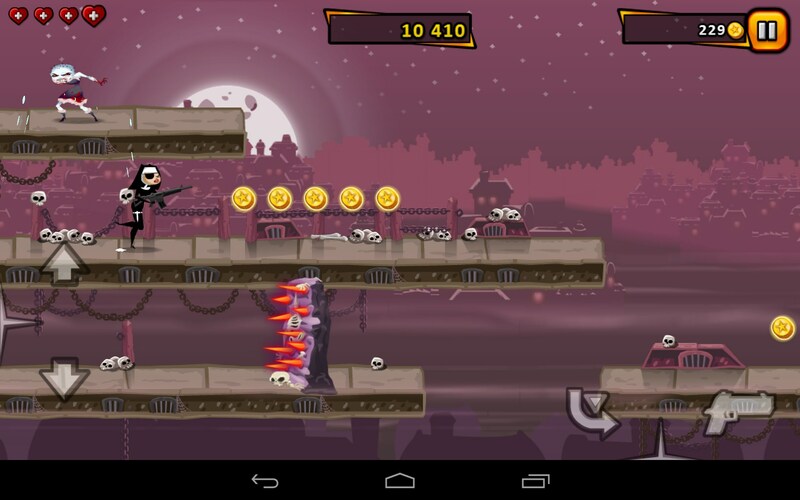 The disadvantages of the game include a very high complexity of the game in comparison with other representatives of the genre. Each next world is becoming much more difficult to the previous one, and the monsters are no longer die after one shot. Thus, there is no such feeling as in Temple Run, when it all depends on your skill. 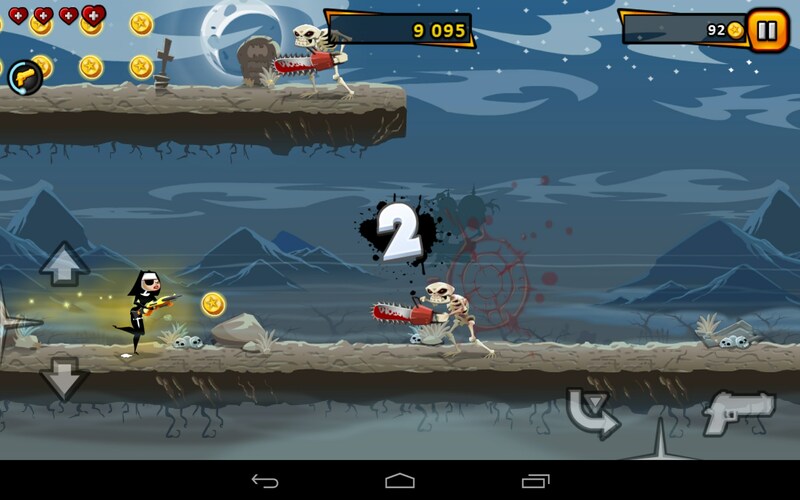 Nun Attack: Run & Gun - is a fascinating endless arcade game for Android, which fans of the genre like "Runner". The game is free, but the in-game shop.